The Lamborghini Gallardo is the Italian automaker’s best-known and most popular car. In production since 2003, more than 10,000 Gallardos were built before the end of the decade. The version of the Gallardo that is equipped with a V10 engine is Lamborghini’s best selling vehicle. 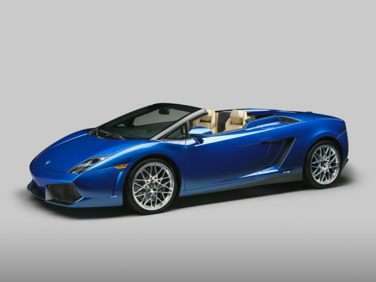 The Gallardo is available as a two-door coupe and a two-door Spyder convertible. When the Lamborghini Gallardo was first available for sale in 2004, it came with a 5-liter V10 engine that was paired to either a six-speed manual transmission or a six-speed semi-automatic manual unit that offered drivers the ability to make faster shifts. Many changes were implemented for the 2006 model year, including improved suspension, a higher performing exhaust system, lowered gearing for more responsive driving, and a small increase in horsepower. This is also when the convertible version of the Gallardo first became available, with a soft retractable top. The Gallardo Superleggera followed another year later, boasting a weight loss of 220 pounds thanks to the extensive use of carbon fiber throughout the car to replace some of the base Gallardo’s panels, and a computer and intake upgrade netted another 10 horsepower over the base model. The Gallardo Superleggera was discontinued a year later after a production run of 172 cars, which also marked the end of the first generation of Gallardo. The updated Lamborghini Gallardo launched in 2008 at the Geneva Auto Show and featured a new 5.2-liter V10 engine that yielded 552 horsepower and a top speed of 202 miles per hour. This Gallardo also featured a new launch control system and a vehicle tracking system. The similarly updated Spyder version premiered later that year at the Los Angeles Auto Show. The Paris Auto Show in 2012 featured an updated Gallardo to commemorate the 2013 model year. This Gallardo had updated front and rear fascias and an exclusive alloy wheel design. Each generation of Lamborghini Gallardo also had several limited editions. These cars helped Lamborghini maintain an air of exclusivity about the car while simultaneously increasing interest. Some of the special editions were available in exclusive colors and some even featured two-tone or three-tone paint jobs and contrast roofs. For the most part, special editions were mechanically similar to the regular production run Gallardos, differing mainly in exterior and interior refinements, but there were some exceptions. Certain limited editions actually did feature mechanical modifications. The Gallardo Balboni edition was designed to be rear-wheel-drive, and the Super Trofedo Stradale was essentially a street legal version of one of Lamborghini’s race cars.